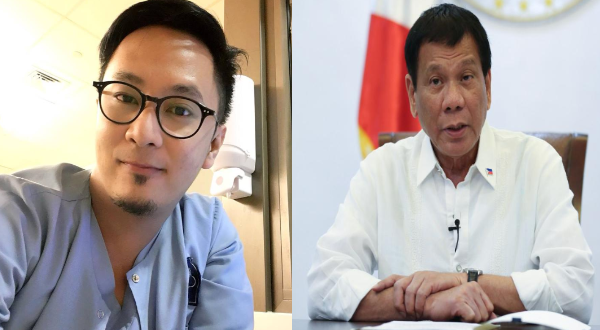 An overseas Filipino nurse said in his Facebook page that President Rodrigo Duterte is not a man worthy of respect, regardless of the fact that he won the Presidency on May of 2016. Aquino, Carlvon Aquino, a nurse in Jeddah, Saudi Arabia,said that the mere election of an official does not entitle him to respect that is absolute enough to overpower the respect intended for God, the state and the filipino men. "And when these are not met, the need to defy is utmost. That’s a constitutional BASIC. It’s a fundamental constitutional concept," he said on July 26. He asked people to quit the thought that cannot help the nation with dissents and protests. Aquino explained that it is this dissenting concept that maintains balance, the very heart of democracy and that the reason why there are protests is a wrong has been so powerful and the need to stop it is urgent. Protests have never been a missing part in the state, being a democratic republic. The OFW said that for him, he defies the concept of respect where there is already a gruesome and grave abuse of power and position. adding that that kind of abuse eliminates the person’s entitlement to respect for person in authority. "Moreover, respect to service, respect to God, respect to the state and respect to the Filipino people is of higher absolute value and demand, rather than the kind of respect intended for only a single person in position. Isn’t it that we regard life, God, country and the sovereign people FIRST than any office provided by the land," he added. He said that former President Benigno Aquino also was accorded support by the country, just not as big as President Duterte. "It is for the state and for the general welfare why protests and unions are created and done. We don’t actually disrespect the president. We respect the things above him that he doesn’t choose to respect," he concluded. I love the thought of just respecting him, but i would like to remind you that respect is due only for the one who deserves it. It came to me that respect was no longer a wise call where the very fundamental function of his office becomes a threat to the constitution rather than one performing a rightful mandate. Secondly, do we actually disrepect the President when we voice out dissent, a basic, absolute right granted to us by the very law he is bound to protect? I believe we don’t. We dont respect one person just because he is the one elected. PNOY received similar treatment but not on his early leading years and not as big as this. All presidents have had a bitter bite of groups expressing out their dissents, dismay and etc etc etc. Personally, i defy the concept of respect where there is already a gruesome and grave abuse of power and position. That kind of abuse eliminates the person’s entitlement to respect for person in authority. Moreover, respect to service, respect to God, respect to the state and respect to the Filipino people is of higher absolute value and demand, rather than the kind of respect intended for only a single person in position. Isn’t it that we regard life, God, country and the sovereign people FIRST than any office provided by the land? The mere election of an official does not entitle him to respect that is absolute enough to overpower the respect intended for God, the state and the filipino men. And when these are not met, the need to defy is utmost. That’s a constitutional BASIC. It’s a fundamental constitutional concept. Please erase from your mind that people cannot help the nation with dissents and protests. THAT IS WRONG. Actually, it is this dissenting concept that maintains balance, the very heart of democracy. The reason why there are protests is because something is already wrong to its grave extent and that something very powerful needs to be stopped immediately. It is for the state and for the general welfare why protests and unions are created and done. We don’t actually disrespect the president. We respect the things above him that he doesn’t choose to respect."